What Causes Arch Pain ? There are several reasons why arch pain develops. Sometimes it?s due to a condition known as plantar fasciitis, in which the plantar fascia (the band of tissue that runs along the bottom of your foot from your heel to your toes) becomes inflamed after excessive stress. Heel pain results from this inflammation. Sometimes the pain is due to extensive time spent on your feet. Many people feel pain on the arch of their feet after a long workday, while others overuse their feet exercising or playing sports. A foot deformity, such as hammertoe or clubfoot, can also cause this pain. Medical conditions such as diabetes or obesity can put additional stress on your feet, thereby causing arch pain. Your footwear is also important. Shoes should support all parts of your foot, especially the bottom. This is very important if you spend excessive time on your feet, if your obese, if your pregnant, or if you engage in sport-related activities. Injuries to any of the twenty-six bones, thirty-three joints and over 100 muscles, tendons and ligaments in the feet can also cause arch pain. Because the foot is such a complex structure, it?s important to see a podiatrist at the first sign of symptoms. Cortisone, a type of steroid, is a powerful anti-inflammatory medication. It can be injected into the plantar fascia to reduce inflammation and pain. Your doctor may limit your injections. Multiple steroid injections can cause the plantar fascia to rupture (tear), which can lead to a flat foot and chronic pain. Supportive shoes and orthotics. Shoes with thick soles and extra cushioning can reduce pain with standing and walking. As you step and your heel strikes the ground, a significant amount of tension is placed on the fascia, which causes microtrauma (tiny tears in the tissue). A cushioned shoe or insert reduces this tension and the microtrauma that occurs with every step. Soft silicone heel pads are inexpensive and work by elevating and cushioning your heel. 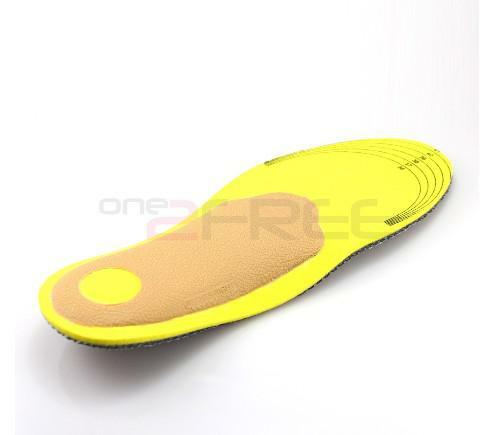 Pre-made or custom orthotics (shoe inserts) are also helpful. Most people sleep with their feet pointed down. This relaxes the plantar fascia and is one of the reasons for morning heel pain. A night splint stretches the plantar fascia while you sleep. Although it can be difficult to sleep with, a night splint is very effective and does not have to be used once the pain is gone. Your doctor may suggest that you work with a physical therapist on an exercise program that focuses on stretching your calf muscles and plantar fascia. In addition to exercises like the ones mentioned above, a physical therapy program may involve specialized ice treatments, massage, and medication to decrease inflammation around the plantar fascia. Extracorporeal shockwave therapy (ESWT). During this procedure, high-energy shockwave impulses stimulate the healing process in damaged plantar fascia tissue. ESWT has not shown consistent results and, therefore, is not commonly performed. ESWT is noninvasive-it does not require a surgical incision. Because of the minimal risk involved, ESWT is sometimes tried before surgery is considered. Drink plenty of water before, during and after your workout. Dehydration is a common cause of muscle cramps, according to MayoClinic.com. If your workouts are long and strenuous, drink a carbohydrate-based electrolyte beverage too. Warm up the muscles of your feet before you work out. A simple exercise is to write the letters of the alphabet with your toes. Perform the warm up with bare feet and exaggerate the movements to challenge your muscles. Wear properly fitted shoes. Visit a sporting goods store and get your feet and arches measured. Ask for help selecting a pair of shoes to fit your workout. For instance, if you play soccer, you need cleats, not running shoes. Take a break. Cramps can be your body's way of telling you you're exercising too much, according to MayoClinic.com. Rest for a few days, then resume exercise and see if you can complete a workout without arch cramps. Stretch. At the end of your workout, perform a few stretching exercises to keep your muscles from tightening and cramping. Sit down, lean over and grasp your toes. Pull the toes toward your body until you feel tension in the arch of your foot. Hold the stretch for 20 to 30 seconds, then repeat on the opposite side. Another easy way to stretch your arch is to put a towel on the floor, curl your toes around it and pull it toward your body.